I accidentally deleted my first review of this film and have been sulking for more than 2 weeks because Blogger doesn't allow undelete! What irks me more was the fact that I was very pleased with what I had written - hopefully this will at least be okay! I know I was slow off the mark catching up with this. I was wondering what an apocalyptic story aimed at teens, set out in a trilogy, about teens killing one another would be like. I found it to be a gripping drama that excited my moral imagination and which raised a number of interesting ethical questions. However, a story predicated on teenagers having to fight to the death in a media spectacle is a questionable basis for an uplifting film. Yet, the viewer cannot help but be inspired by the emergent heroine Katniss Everdeen (Jennifer Lawrence) and wonder where the story will go. Some of them it addresses and some are left open - possibly to be explored in the sequels. Many teens today spend a lot of time within the virtual worlds of video games where first person shooter games are common. This film follows that format as Katniss volunteers at the annual reaping to take the place of her sister in the 74th Hunger Games. Each year two teenagers, one male one female, are chosen from each of the 12 Districts to compete within a locked environment where the winner is the survivor. But the film is more than simple 'shoot em up'. It shows us substitutionary sacrifice, distaste for the horror of war, an innate reluctance to take another life, how wealth can causes a numbing of compassion and how power corrupts. In essence it offers viewers - and teens in particular - an arena in which to exercise their moral imagination and explore the right and wrong of a range of fundamental social ethical issues. Today's teens have grown up only in a post 9/11 world - for them there is no other lived experience to draw from. They, like many today, sense that morality is skewed and they want to find a way of making meaning that allows them to reset their moral compass to follow something more organic, more believable and something which they can own for themselves. 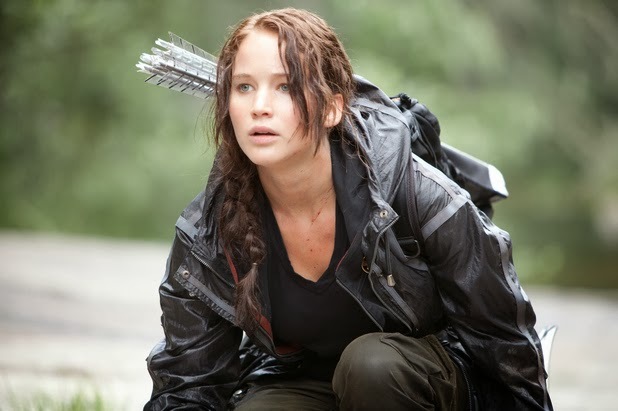 Katniss Everdeen is a reluctant heroine but she does give hope to the marginalised, the oppressed - the hope-less. On one level she is just a resourceful girl from District 12, on another level she is the face that can rally the common people and inspire them to rise up. When President Snow (Donald Sutherland) says, 'the only thing stronger than fear, is hope' I got the feeling that this was giving permission for the hope that Katniss inspires to ultimately topple Snow's reign of fear. Let's see where the sequels take us. I felt that the film paid homage to other films in it's conception, design and delivery. The Truman Show is an easy parallel to spot. Films like 1984, Hannah, Harry Potter, District 9 and Gladiator also find a resonance. Because of the central premise of the film I wanted to not like it. I was however gripped, drawn in, made to feel empathy for Katniss and her family and friends. I jumped and cringed in the appropriate places and as a piece of escapist entertainment I was hooked. Does that mean I had to suspend moral judgement as I watched? Maybe. Does it mean that the issues the film raises and the characters through which they were raised have repeatedly come back to me as I have continued to reflect on the film and its meaning - absolutely! I'll give it 8.5/10.